This weekend Mr. Cupcake and I drove down to Munich to celebrate a friend’s birthday and as part of the gift, I also brought along a foursome of cupcakes for the birthday girl. I decided to try a recipe that Mr. Cupcake’s mom makes in the form of a cake. As with all German cakes, this one is easy on the sugar and big on the healthy ingredients. This recipe calls for fruits and vegetables in the batter, but is still wonderfully light and fluffy like a true cupcake. 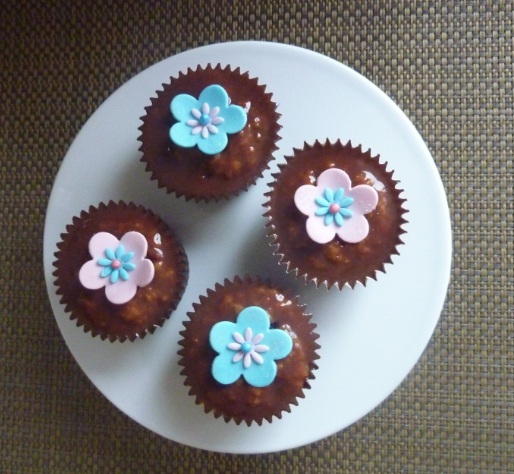 As soon as the two words: ‘fluffy and light’ came out the mouths of this recipe’s testers, I knew I had given birth to a new cupcake baby, even if it does have a certain green vegetable in it. For the topping I made a milk chocolate ganache which was too runny unfortunately. It was my first time using milk chocolate with hot cream and the glaze came out too thin. Either way, the milk chocolate was the perfect accent flavour with the zucchini and nuts in the cupcake. Even if the surface was a bit bumpy due to the nuts, I know that with a second coat of less creamy ganache, all would have been right in the world and although the appearance wasn’t the smooth finish I was after, I was delighted with a new wonderful flavour combination. 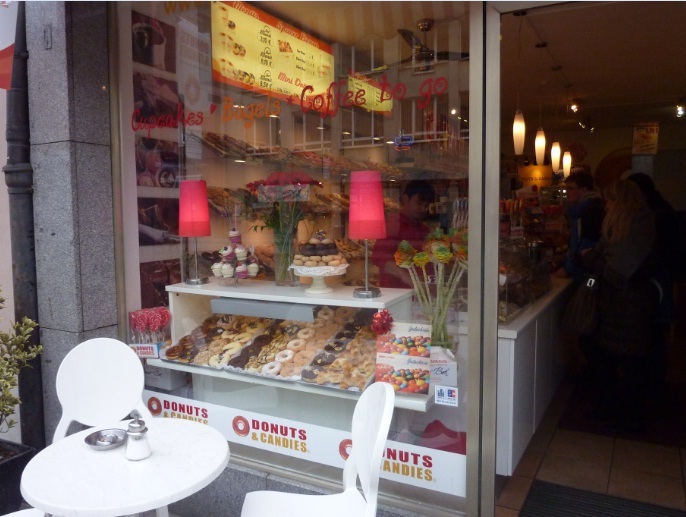 After enjoying my cupcakes with the birthday girl, Mr. Cupcake and I headed to find cupcakes in Munich and we found some here. Extremely solid and waxy McDonald’s-like frosting covering a dense de-frosted muffin-like cake. To be honest the frosting wasn’t so bad. It wasn’t too sweet and tasted extremely like white chocolate. The bad points were that it was quite waxy on your teeth and did not even dent when the cupcake fell over in the bag. The dense bottom was not rich in flavour and rather plain. 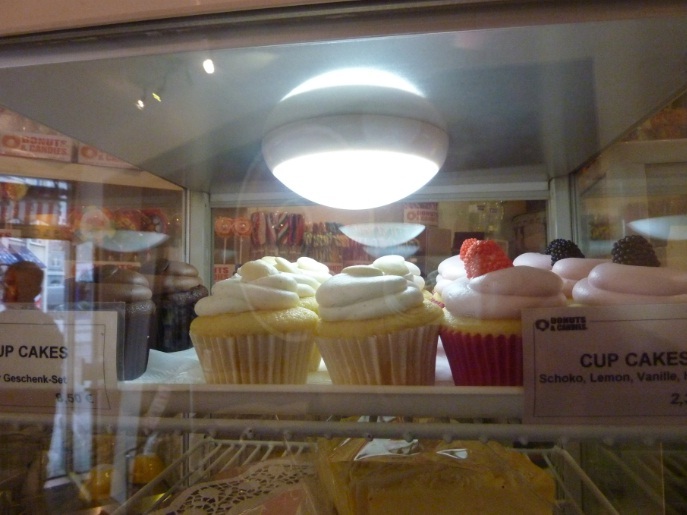 It was also quite dry as the cupcakes are kept refrigerated. Overall, I would go back for the delicious donuts but not for the cupcakes. After eating it, I explained to Mr. Cupcake my very real concerns. 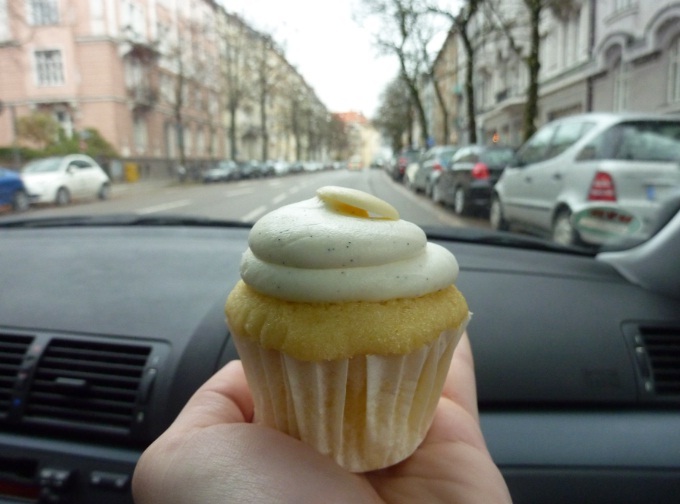 I have now eaten quite a few bad cupcakes in Germany and it seems that an excellent cupcake is hard to come by. And if Germans, start to get bad impressions about cupcakes when they try one at a local McDonald’s for example, then really the cupcake trend will never truly pick up. They will become jaded by bad cupcake experiences and wonder why they should ever buy any. So here is my solemn oath to all lovers of cake (soon-to-be-cupcake converts): Never fear, fluffy, light, deliciously deep in flavour cupcakes are on their way. And there’s more. They will look as glorious as they taste. As I learn the craft of sugar decor, I promise to bring creative and mesmerizing little pieces of individual art to each little bite of goodness. 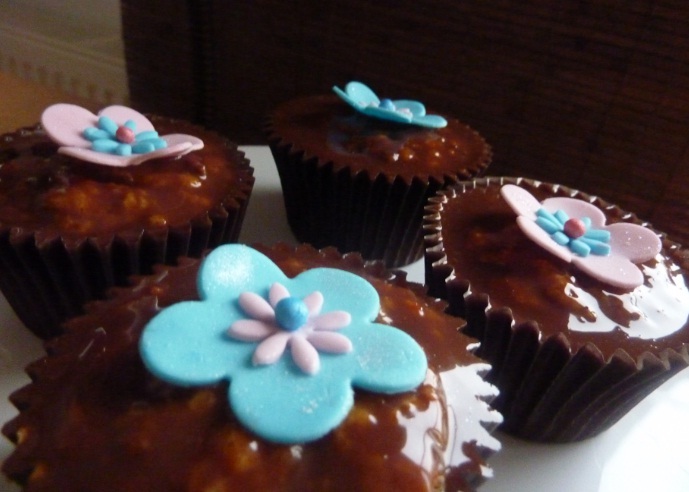 So stay tuned as I hone my skills, perfect more recipe and bring these cupcakes into reality post by post. I have been in touch with the nice dude that set up the place. :) He talked about his experience in setting up the business.